Misty Moon Exhibitions and Events was created in 2009 as a small arts and craft fair at St Hilda’s Church Hall in SE London. Misty Moon then went on to hold critically acclaimed exhibitions at a small local gallery, where we exhibited work by local and international artists. The work was on the dark and quirky side of life. Adrienne King star of the original Friday the 13th, came to Misty Moon to exhibit her paintings and to meet her fans. It was at this time The Misty Moon Film Society was born. Adrienne put her name to Misty Moon and supported us in our development. 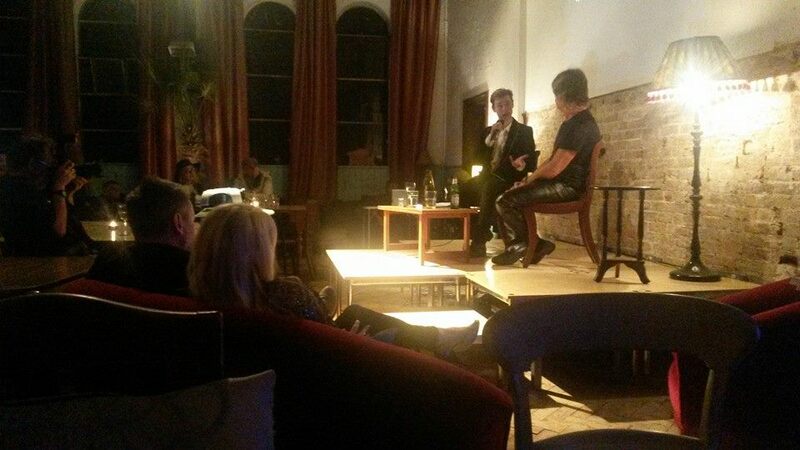 We started to hold cosy evenings with actors and actresses from cult TV & Film with a limited audience of 40. The evenings include a Q&A hosted by Misty Moon’s outrageous MC Chris Collins, an autograph and photo session and a meet and greet with the guests. The audience and guests love Misty Moon because of the intimate experience they get. As we say to everyone, “It is like going to a friend’s house for a couple of drinks and to chat about your favourite film”. The guests we have had include: Danielle Harris, Ken Foree, Michael Berryman, Lynn Lowry, Fenella Fielding, Robin Askwith, Richard Kiel, Kate O’Mara, Nicola Bryant, Katy Manning, Louise Jameson, Sarah Douglas, David Barry, Linda Regan, Anita Harris, Brian Murphy, Madeline Smith, Caroline Munro, Sally Geeson, to name but a few. Our Honorary Patrons are Nicola Bryant who played Peri in “Doctor Who” and David Barry who played Frankie Abbott in “Please Sir” and “The Fenn Street Gang”. Our evenings are held at FlatPlanet, 39 Great Marlborough Street, London, W1F 7JG and we are also currently touring with Robin Askwith. An Audience With Robin Askwith has performed at Upstairs At The Gatehouse in Highgate as part of The Camden Fringe Festival, Emporium in Brighton and we are currently booked at The Cinema Museum and The Lost Theatre in London.